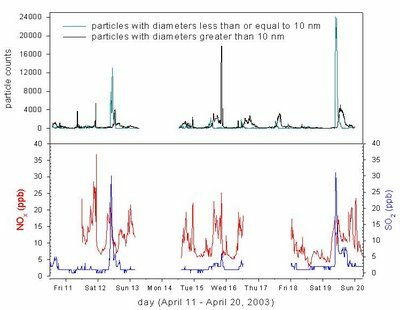 Fast forward to 2006: Svensmark and colleagues’ laboratory experiments show that highly ionizing radiation can create ultra-small aerosol particles. As soon as the paper is published in the Proceedings of the Royal Society, they put out a press release for the world’s newspapers explaining that this result implied that all past climate changes were now understood and all future climate changes could be predicted simply from a knowledge of the intensity of these ‘cosmic rays’…. History repeating itself? Well, not exactly. Tyndall actually restricted himself to describing his experiments and simply linking it to the work of Fourier a few decades earlier. It took more than another century before the credible quantitative estimates of these effects and their influence on past and possibly future climate were made, along with good enough observations of the gases to know that they have (and continue) to change significantly. However, Svensmark and colleagues, not wanting to wait for the credible quantitative results to come in, instead short circuited all of that tedious follow-up work, scaling up to realistic conditions, theoretical and modelling studies demonstrating that their effect was indeed viable, and simply declared in their press materials that the team had ‘discovered that cosmic rays play a big part in the everyday weather’ and ‘brings to a climax a scientific quest that has lasted two centuries’. Nobel prizes all round then. Svensmark’s paper itself is indeed of some interest. Aerosol processes are among the most uncertain, and most studied, aspects of climate and these experiments (they bombarded a clean mixture of water, SO2, O3 and air with high energy UV and saw small H2SO4 droplets form) might be useful in adding to that field. One could quibble with the use of the high-energy UV (which never penetrates to the lower troposphere), and the high concentrations of SO2 and O3, but by far the biggest problems lie in the study’s relevance to the real world atmospheric conditions. First, the particles observed in these experiments are orders of magnitude too small to be Cloud Condensation Nuclei (CCN). In the press release, this is why they talk about the ‘building blocks’ of CCN, however, aggrandisation of these small particles is in no sense guaranteed (Missing step #1). Secondly, the focus is on low clouds over the ocean. However, over the ocean, there are huge numbers of condensation nuclei related to sea salt particles. Thus to show that the cosmic ray mechanism is important, you need to show that it increases CCN even in the presence of lots of other CCN (Missing step #2). Next, even if more CCN were made, you would need to show that this actually changed cloud cover (or optical thickness etc.) (Missing step #3). And given that change in cloud properties, you would need to show that it had a significant effect on radiative forcing – which despite their hand waving, is not at all well quantified (even the sign!) (Missing step #4). Finally, to show that cosmic rays were actually responsible for some part of the recent warming you would need to show that there was actually a decreasing trend in cosmic rays over recent decades – which is tricky, because there hasn’t been (see the figure) (Missing step #5). All of this will require significant work and there are certainly no guarantees that all the steps can be verified (which they have been for the greenhouse gas hypothesis) – especially the last! However, they would seem essential to justifying the claims in the press releases. Will these results be a spur to future research? Possibly. But the ridiculous spin put on this paper is liable to continue to put off mainstream scientists from pursuing it. It’s as though Svensmark and co. want to enhance the field of solar-terrestrial research’s bad reputation for agenda-driven science. Unsurprisingly, this paper was trumpeted throughout contrarian circles last week and was received uncritically (with one honorable exception in the ‘climatesceptics’ discussion group), even by people who normally spend their time decrying science-by-press-release. (A word to the wise, consistency goes a long way to establishing credibility…). At RealClimate, we’ve often criticised press releases that we felt gave misleading impressions of the underlying work and lead to confused, and sometimes erroneous, headlines, but this example is by far the most blatant extrapolation-beyond-reasonableness that we’ve seen. If this group wants to be taken seriously and interact constructively with the rest of the community (which is the only way the ‘missing steps’ will get sufficient attention), they have to act in a serious manner, be honest about the problems and caveats, and resist the temptation to speculate beyond what is justified. The kind of antics seen in this case may play well for the peanut gallery, but they won’t impress the critics. “Hence, variations in cloud cover caused by cosmic rays can change the surface temperature. The existence of such a cosmic connection to Earth’s climate might thus help to explain past and present variations in Earth’s climate. So, the press release in itself only suggests, with conditionnal (“may”, “can”, “might”), that variations of low-cloud nebulosity linked to cosmic rays are to be considered for a better estimate of mean global temperature’s trend. * Everyone accepts that cosmic rays are the principal source of ions in the lower atmosphere. The ion density is around 1000/cm3. * Is the availability of ions the limiting factor in forming cloud condensation nuclei or is the availability of other species limiting. * Are there other ways of forming cloud condensation nuclei (CCN) besides around ions and if so (it is so) what is the relative importance of each type of CCN and what are the characteristics of the CCNs. And, I think the figure at the end from a Mexico study pretty well shows that under normal conditions SO2 is limiting for forming small aerosols. I think it is reasonable to assume that these particles can grow to become CCNs. Finally, the obsessions that one has determine the information available to you and then the direction from which you attack a problem. Our two comments illustrate that, but also raise the question of who were the referees? CR is a quite complex matter and I’ve no particular competence for a personal evaluation of the researchers’ conclusions in this field. I know that Usoskin et al. have recently suggested a latitudinal dependence of nebulosity-CR relationship, with strongest correlations observed over 20-55 °S and 10-70 °N. I guess that cosmic ray intensity could varies over the globe in relation to geomagnetic field. Any opinion about that ? Is the decreasing CR trend of your figure based on one neutron monitor or on a composite index ? Quite a sound demolishing of the claims in the press release. I especially liked the link to Rabett Run ( http://rabett.blogspot.com/2006/10/svensmark-stumbles-into-smog-chamber.html ), where Eli points out that the SO2 level used in their study, 5000 ppb, is 167 times as high as a very smoggy day in Mexico City, at 30 ppb. Eli also references a graph ( http://photos1.blogger.com/blogger/4284/1095/400/Aerosol.jpg ) that shows an excellent correlation between spiking SO2 levels and spiking >10 nm aerosol particles. As you pointed out before, Gavin, “why are they spending millions on this study again?” It’s as if I “discovered” that there’s a strong correlation between fires in houses and child deaths, and then claimed that this burning process is primarily responsible for all non-disease deaths in children (Fires are 5% of deaths 0-17 in the US: #1 is motor vehicle accidents, 45%; #2 is firearms, 14%; #3 is suffocation, 12%). Sheesh. Real Climate should not restrict any postings on the solar or any other issue it deems important. Your track record is solid on this. If the topic is misused, we need to understand the (RC) logic. I’m very impressed by this site but I sometimes long for more explanations, at least for those of us that last attended science class 40 years ago. Think of how many more people you could reach. Keep it up. A “latitudinal dependence … with strongest correlations … 10-70 °N” may help explain the warm dust bowl years of the 1930s and contributions to higher global temperature 1930s-1940s. I’ve enjoyed your blog for quite a while and now that you are commenting on a paper that I co-authored (I’m a PhD-student on the project) I felt that it was time to contribute actively. The SO2-bottle that we used was indeed a 5 ppm mixture, but it was diluted heavily with a resulting concentration of around 80-230 ppt in the chamber. The ozone concentration of about 25 ppb fits with the 20-40 ppb for marine environments given in the book by Seinfeld and Pandis (Atmospheric Chemistry and Physics p. 310). Step 1+2 (impact on CCN): I agree that this absolutely needs to be investigated further. Our proposed mechanism could produce quite a lot of aerosol but only future studies can show the precise impact. Step 3 (impact of CCN changes on cloud properties): I presume that you are talking about whether the change in amount of CCN will be great enough to alter cloud properties? If yes, then that is also something that requires further investigation. Step 4 (effect of clouds): I thought that this was relatively well understood? The results from the ERBE experiment (Hartmann, Academic Press, 1993) show that low clouds (below 3 km) have an overall cooling effect. Step 5 (GCR trend): I am no expert, but as I understand it is not so easy to determine if there is a trend on the short timescales or not. Carslaw et al (Science 2002) conclude that there is one for this century, but it others arrive at different conclusions. Finally an opinion of my own: Press release or not, I am in no way out to attribute what has gone on in the last century solely to cosmic rays or anything else and I am certainly not out to belittle the effect of CO2 and other greenhouse gases. To me this is simply an interesting piece of science that looks like it could be another piece of the climate puzzle. If the size of this piece is big enough to make an impact on past, present or future climate is the subject of future research. If anyone has any questions regarding the paper please feel free to ask, and I shall try to answer. I apologize on beforehand for slow responses as I am quite busy doing more experiments at the moment. Don’t apologize! I personally needed this information and had questions about it until you cleared it up in this article. Great job! Keep doing it! Martin, you’ve probably read the earlier thread about press releases; tell us about yours? — did you or your coauthors participate in writing, or have an opportunity to edit, that press release before it was sent out? Who did write/edit/approve/release it? Unsurprisingly, this paper was trumpeted throughout contrarian circles last week and was received uncritically (with one honorable exception in the ‘climatesceptics’ discussion group), even by people who normally spend their time decrying science-by-press-release. If this occured via blogs or some other online resource, you (or anyone else reading this thread) really should provide links to this stuff. Milloy is certainly no shock, but it would be interesting to see who else is trumpeting this study. Documenting other people’s willingness to believe is extremely important IMO. This is especially true when it comes to “experts” that have no excuse for falling for such a horribly flawed study. Gavin, this was a well written, exceptionally clear and concise post. Keep up the great work. According to thebookseller, Henrik Svensmark and Nigel Calder (ex-editor of New Scientist and author of Cosmic rays before seven, clouds by eleven) have written a book, “The Chilling Stars – a new theory of climate change”, to be published by Icon books. Anyone else heard about this book? Hi Martin, I’ll correct that on my blog, but you still are high on O3 and UV, which means high on OH. Also, are you sure that the 25 ppb is for SO2 and not DMS? To play devil’s advocate, the lack of correlation in the figure above doesn’t rule out an effect because there’s an integration between CR forcing and temperature. Svensmark et al. might argue that temperature could be rising in recent decades due to disequilibrium from past CR-cloud changes (i.e. cosmic rays fell, then circa 1950 leveled off at a weak/warming level and it’s taking temperature a while to catch up). The unattributed C14 reconstruction in their background article would seem to suggest that they’re thinking long term. Other recent reconstructions (Muscheler, Usoskin, Solanki) wouldn’t directly refute that argument. What would? What about the so called Solar Pulse that allegedly exists (hope I am not spouting MTV science again) but I read about it in Fred Pearce’s Book ‘the last generation’ and had appeared to have empirical evidence to back it up. Re: Step #2 and the effect of aerosols on low cloud. I realise from the response to #7 that this is an active area of research, but I had heard it as an explanation for why aerosols from China were having less of a radiative cooling impact. Westerlies would carry Chinese aerosols out over the large Pacific ocean, where they would be rained out before they could reach land, whereas European aerosols would be carried west over the large Eurasian continental landmass. The warming trends in looking at numerous 100 year temperature plots from northern and high elevation climate stations … i.e. warming trends in annual mean and minimum temperature averages, winter monthly means and minimums and especially winter minimum temperatures and dewpoints … indicate climate warming that is being driven by the accumulation of greenhouse gases in the atmosphere – no visible effects from other things like changes in solar radiation or the levels of cosmic rays. Greenhouse gas emissions are completely overwhelming all other changes in forcing in driving global warming. There are other articles recently put out with spin to downplay greenhouse warming, which I refuse to post at public websites. Re: Gavin. Thanks for the paper – I´ll look at it. Re: Hank. Since I´ve been down at CERN preparing our next experiments I´ve had nothing to do with the whole press release thing and frankly I am not sure exactly how it was made. We all agreed in the group that we did not want it to be another GCR vs. GHW debate but it seems to be this angle that the media is most interested in (sadly, but somehow understandable). I hope that at least in the scientific community it will be the science and not the spin that will be the main focus. Re: Eli. Looking at the growth of the particles we estimate the amount of condensable vapour (which in this case is mainly sulphuric acid, from the oxidation of SO2 by OH). In all experiments we seem to be below the level at which classical nucleation theory predict nucleation, but we are getting particles anyway. This has also been observed by Berndt et al (Science 2005). For our new experiments we will (hopefully) get even better estimates of sulphuric acid by using a special mass spectrometer that can detect sulphuric acid at very low concentrations. On this point (for Gavin, Martin, or anyone else), how do we presently predict the behavior from ultrafine particles (1-2 nm, or even > 3 nm in Svensmark et al experiment) to CCN (approx. 50-100 nm) ? If “aggrandisation is not guaranteed”, could we just expect from cloud microphysics models that more particles > 3nm will most probably imply more CCN in troposphere ? And if no, what are the main theoretical issues about that process (and references to go further) ? Another way the sun may interact with climate — I’d sure like some estimate of the relative magnitudes of the various effects. Received 7 July 2004; revised 22 December 2004; accepted 3 January 2005; published 19 February 2005. It is proposed that Earth’s climate may be modulated, in part, by changes in the flux of ultraviolet/blue light into the oceans. This occurs, at a range of timescales, through solar variability and from damage to the ozone layer. A conceptual model is presented where, through a number of synergistic processes and positive feedbacks, changes in the ultraviolet/blue flux alter the dimethyl sulphide flux to the atmosphere, and in turn the number of cloud condensation nuclei, cloud albedo, and thus sea surface temperature. The greatest effects are expected in the oligotrophic subtropical oceans, under the Hadley circulation, in summer….. I know we’re seeing a lot of info recently on how much plankton activity there is; I’d expect a fast feedback from plankton to any cloud change. I don’t know how variation in sunlight relates to variation in cosmic rays at all. One still has to provide their empirical evidence, data, and provide the methodology that will explain the “why and what”, or say if A occurred before B, then B is the result of A… one still needs to SHOW EVIDENCE that A caused B not “imply” because A happened first, its linked, or correlated, because this may or may not be true. A supporting hypothesis gives credence to an underlying explanation for a cause and effect relationship for which one is claiming that would go towards explaining the nature of the how, the why, the what, … of the cause and effect behind a scientific hypothesis. I do understand there is room for a certain amount of creativity in the scientific world in research undertaking to be interestingly liberal, but if one wants their hypothesis to show cause and effect relationships, then it’s part of the standard scientific method to publish it with the research establishment evidence of the cause and effect relationship in one’s papers rather than correlations, links, or anecdotal notions to buttress it. Furthermore, many high profile journals, that I will not mention (check the article submission rules) , seem to seek to publish papers that are of interesting readership content, even if they are peer reviewed, rather than being concerned if a paper is providing documentation of a cause and effect relationship to their reading audience. I find the discussion here, especially the posted plot, quite misleading. Svensmark, et. al., claim that cosmic rays have a strong effect on low cloud cover, not a direct effect on the temperature. There is extremely good evidence that is true as can be seen from Figure 4c in http://spacecenter.dk/xpdf/influence-of-cosmic-rays-on-the-earth.pdf . I also find it appealing that they test their proposed mechanism with an experiment, not a computer model, which can be refined until the details of the cloud modulation are understood. Re #23: This is a much more useful result than Svensmark et al, and the take-home conclusion from it is that while the GCR effect on clouds is real it can’t explain late 20th century warming. There’s also a pretty recent overview of the whole issue here. Re: 24/Gavin: The correlation is ‘rescued’ by making an arbitrary ‘correction’ that is not supported by the original data generating group (ISCCP) but that just ‘happens’ to match their previous correlation. The alternative, which is not entirely implausible, is that clouds correlate to cosmic rays but there is also some other effect whose influence is comparable in magnitude to the correlation and is responsible for the trend. One can “rescue” the correlation by removing a smooth quadratic fit over the whole record, just as easy as applying Svensmark et al. abrupt slope adjustment. If you permit one to remove the trend then the correlation continues to be reasonable, but if one accepts that there is some other large variation unrelated to cosmic rays, then of course that diminishes the relative significance/importance of the cosmic ray correlation. Re:25, the link to the overview does not work, Re: 26 is there a link somewhere to this figure that is not via subscription? Also I see that the Danish Space Research Institute involved with the study is primarily supported by two private foundations. Not to be skeptical but what are these foundations? I have a couple of questions that I have never seen addressed by the high-climate sensitivity scientists. First, how do you reconcile a high climate sensitivity (say 3-5 C/doubling) with the fact that there is very low correlation between CO2 and climate in the 500 million time scale? Especially concerning is how it is possible to reconcile concentrations more than 10 times higher than current CO2-levels with am ice age epoch even colder than the current epoch. Second, as far as I can tell the only scientific motivation for a high climate sensitivity is to be able to reproduce the ice ages with milankovitch cycles. However, the assumption here is that the only cyclic signal is due to changes in the Earths orbit, but evidence (e.g. Sharma02) suggests that the sun itself may be varying in activity. I have to this date never seen these variations in actual solar activity/cosmic ray flux taken into account when modelling previous ice age cycles, which I find deeply concerning. Empirical evidence suggests that there is a much larger external climate forcing than the Milankovitch cycles and this in turn implies that climate sensitivity must be much lower than currently believed. Thirdly, any answer to why the tropical troposphere seems to becoming dryer recently? This seems like completely at odds with model predictions. heh, speaking of overselling papers somebody sent this to me today. “I agree the 11C figure was unreasonably hyped. It’s a difficult line for all scientists to tread, as we need something ‘exciting’ to have any chance of publishing… to justify our funding,” one scientist wrote us. Re 28 what are these foundations? it’s all pretty boring – like NASA and the ESA. It looks to me like a real government agency that gets some incidental foundation funding. Solar posts are way more interesting than posts on editorials or congressional hearings. between low cloud and ionization be confirmed. 1870-1910, but increasing divergence from 1910 onward. It seems like it would be easy to test this sort of hypothesis in a simple EBM attribution study like Crowley 2000 rather than as an isolated phenomenon as above and in Scafetta & West. Hope someone does. Re #28: It works fine for me (with IE). It is a 6.35 MB PDF file, so perhaps that’s your problem? I noticed something odd… In Figure 4 of the press material in Danish there is a good correlation between the cosmic rays and the low clouds up to 2005, but in Figure 4 of the English version, the curves only go to 1995. I had the impression that the correlations broke down after 1989 (Damon & Laut, 2004), and Svensmark had to ‘correct‘ the cloud data in order to improve the fit. He argues that there is a problem with the ISCCP data (Figure 1 in the manuscript with the title ‘GCR and ENSO trends in ISCCP-D2 low cloud properties‘). It is not mentioned in the Danish press material that the curve representing the clouds have been ‘corrected’. I think that this should have been mentioned, even if such a correction were widely accepted. But I do not see that such problems are mentioned on the webpage with the title ISCCP KNOWN AND FIXED ERRORS IN DATA PRODUCTS. So, is there really a problem with the ISCCP data, or not? What have I overlooked? Re 30: You are mistaken, ice ages cycles predict sensitivity towards the low end of IPCC values, though they may be the victim of bad data. High climate sensitivity comes mostly from some climate models, as far as I know. The Sun’s luminosity has increased substantially over the last 500 million years and will continue to slowly increase over the next serveral billion years until it becomes a red giant. One would thus expect a higher temperature today for the same CO2 levels than 500 mya. There is a missing #6 in your list above, after you’ve done #s 1 through 5. You also have to show that the magnitudes match up; that is, that the long-term decrease in GCRs explains the amount of warming that we see in the late 20th and early 21st century. Just as an order-of-magnitude effect, it appears from Fig. 4 of http://rumcenter.dk/xpdf/kosmisk_straaling_klima.pdf that low cloud cover changes maybe 1.5% in response to a full cosmic-ray cycle of 14%. If we allow that all those clouds are cumulus with an albedo of 0.8 and that they block water with an albedo of 0.1, that translates to a change in global albedo of 0.014. A global change of albedo of 0.014 in my simple Arrhenius model of the Earth equates to a temperature of 1.4 K, or maybe 2.4 K after feedbacks; I’m not sure, since the GISS site http://www.giss.nasa.gov/data/simodel/ with Hansen’s models is inexplicably offline as I write this. From your graph above, it would seem that there is no long-term trend in GCR; certainly if there is a trend, it is small. A linear regression fit to your smoothed data in the graph sampled every 3 years or so gives a downward trend with a value of about 7% of the size of a solar cycle over the 40-year span observed. 7% of 2.4 K is a full-range shift of 0.17 K, versus an observed warming of roughly 0.4 K over the same period. So we’re shy by a factor of 2.4, if we want to explain the bulk of global climate change by GCRs. This estimate is generous to the GCR hypothesis, since the cumulus-to-water albedo shift exaggerates the true change of low clouds, and I need bond albedos in my calculation and I’m using visible albedos. Apparently we shouldn’t neglect GCRs, but they don’t explain most of the warming, either. I am speaking out of ignorance–fair warning! strong point against the theory being valid or it being a strong factor in climate. The process, under real world conditions, seems poorly understood. As a consequence until one can determine precisely what to measure, any correlation is likely to be weak. 1. Cosmic rays vary in energy levels. Are certain energy levels much more involved in cloud formation, and if so which ones, and do we have a good historical record of those? This would suggest that location matters, and if location matters, that immediately raises the question of where we should look for resulting clouds– an hour “downwind” meteorologically of the cosmic ray measurement, two hours, eight hours? If location matters it also suggests that there will be different relationships between data measured at a particular station and cloud formation — weather formation is influenced by terrain, winds aloft, humidity, and a host of other factors. 3. The theory suggests an interaction between cosmic rays and atmosphere. Atmosphere is not uniform over the earth in location or time. Is the interaction modulated by water vapor, by the density aloft of the atmosphere (which is not exactly the same thing as surface pressure), etc. ? In short we may be in the position of trying to determine if a kitchen stove boils water by measuring the humidity in the living room versus household natural gas consumption. There is likely to be a correlation but it is likely to be weak. Until we know well what to measure, we shan’t see a good correlation. Nonetheless, it seems to me the theory may be on to something. The albedo of the earth is a first order factor in the energy balance, and a small change in the albedo has much practical import. Proof or disproof, I suspect, will require fine measurement of the right things. I hope we get to that point. That could explain a long term trend but does not explain the low correlation between CO2 and temperature in the 500 million year time frame. The fact that temperatures have been very high when CO2 was low and vice versa suggest a weak causal relationship, i.e. a low climate sensitivity. I find this very interesting. According to Shaviv 2005 (see: http://www.phys.huji.ac.il/%7Eshaviv/articles/2004JA010866.pdf) most of the empirical data implies a climate sensitivity at the low end of the IPCC range, even without cosmic rays. The Sun’s luminosity has only increased by about 40% over the last 4.5 billion years. The increase over 500 MY would be only a few percent, and from the Stefan-Boltzmann law (temperature follows the one-fourth power of flux), the effect would be too small to notice. Also, you’re assuming the Earth’s atmospheric composition and surface arrangement and albedo were the same over that period. They probably weren’t. 500 million years is plenty long enough for this effect. The effect is in the ballpark of 5%, since the sun is 30% brighter than when it formed 4.5 billion years ago and the brightening trend accelerates as a star ages (A little educated guessing here, but the rate of fusion increases in proportion to the star’s luminosity and the pressure needed in the core is an inverse relationship to the hydrogen concentration in the core – simple linear interpolation would give a 3.3% increase in luminosity). PS: When were temperatures high and CO2 levels low? From what I understand of the historical record, temperatures moved in line with CO2 with a slow warming superimposed on this (or a slow drop in CO2 levels superimposed). there is an apparent correlation between the detrended low cloud cover (from ISCCP) and the GCR. Between a maximum and a minimum of solar activity (or between a minimum and a maximum of GCR flux) there is a variation of 1% of the mean low cloud cover. Be careful it’s not a relative variation but the absolute variation. the mean low cloud cover is about 28% (from ISCCP). The low clouds are responsible of 25% of the global albedo and in consequence of about -25 w/m2. The absolute variation of 1% leads to -0.9W/m2. So the total influence of the 11 y cycle variation is greater than -1W/m2. It’s maybe the same problem for the long term solar activity variation from 1910 to 1950. So what is false in this? 1) ISCCP inter-satellite calibration is done by offsets for individual satellites, not through trends. For instance, calibration is done using the warmest and coldest deciles from the satellite radiances. Whenever a new satellite stream is introduced there will be offsets in various parameters (so far ISCCP merges data from 33 different satellites) since the calibrations are done for a limited selection of targets, the satellites sometimes see different things and there maybe subtle diurnal or angle related differences. Any new satellite can cause a jump, but it cannot produce a continuing trend. 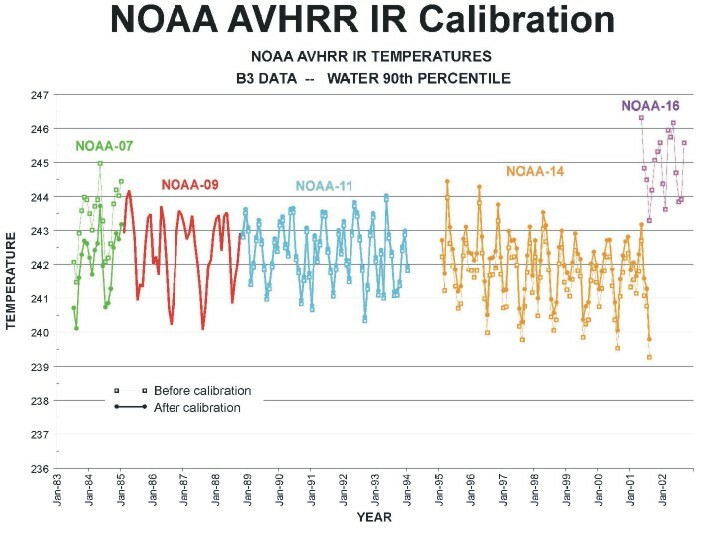 Calibrations are done directly against NOAA-9 (which was the best calibrated of all the satellites and serves as a gold standard for subsequent instruments). Thus the calibration of NOAA-14 (and NOAA 16 – from 2001) is performed directly against the NOAA-9 values, not with respect to overlapping satellites: http://isccp.giss.nasa.gov/JPEG/calib_be4after.jpg ). Thus there is no way the 1994 gap between NOAA-14 and NOAA-11 could have produced an ongoing trend in the ISCCP data. 2) The MS03 trend correction is based on the apparent difference between SSMI and ISCCP. But SSMI only sees water clouds and ISCCP sees both ice and water clouds, thus the trend could be a real effect, or it could be related to drifts in either or both instruments or to drifts in the calibration targets. It certainly can’t be assumed only to be a problem with ISCCP, and cannot have anything to do with the ‘gap’ mentioned above (since that would simply have produced an instantaneous offset). 3) The overall accuracy at the global mean level is at least 2% (one sigma) in the cloud amounts and thus none of the trends or apparent cyclic behaviour at the global mean level are significant. Bottom line: there is absolutely no good reason to put in a trend correction becasue of a gap in the satellites. I am a keen observer from NOAA satellite eyes as well, this time with Polar Orbitting ones. If cosmic rays cause more clouds, then one must look at places where they are hard to form. This would be during the Polar winter over the Arctic Ocean, say mid February, where clouds are scarce. Looking for clouds where there shouldn’t be any is perhaps the only way to demonstrate Cosmic Ray effects. Over the long night, when the Arctic Ocean is mostly totally frozen, the only (non cyclonic) clouds that be are caused by leads (from open water), caused by tidal and wind effects, there are no other aside from ocean air flows. Where are those Cosmic Ray low clouds? Shouldn’t there be some, in a middle of nowhere , with barely enough moisture to create them? By the way, low clouds in darkness increase surface temperature, sort of like the inverse property of commonly understood Cosmic ray effect, not causing a cooling because there are more CR’s, but rather a warming, which only low clouds in total darkness can do, so the probable CR temperature signal gets cancelled from one latitude dark vs bright region to the next. What happens to GT’s then? Should there be no GT temperature trend at all? CR proposed effects are fascinating, would be more interesting if CR proponents can show a few observable examples which actually cause a net trend in temperature. Planet wide . On the 500 Mio year time scale you have to consider continental shifts which have important impacts on climate (e.g. completely different global ocean circulation). There are many factors influencing climate at the same time on all time scales. Thus you will never find a good correlation of one factor at all times. You always have to account for the influence of the other factors before you look at the correlation. The Shaviv 2005 paper has many problems (to be cautious…). Some of the problems are the same which Gavin mentioned in his reply to 46 above (Mixing of Cloud Radiative Forcing and TOA radiative forcing, uncertain CRF before 1950) but there are many more (e.g. a lot of necessary assumptions to get to the result, etc.). Maybe Gavin could comment more in detail. If he hasn’t seen the paper yet, he will be absolutely delighted to see such a nice pleading for cosmic rays influence. The end of the discussion section is really impressive.